About the Seasteading Wiki describes the purpose of this website. If you want to contribute, which is greatly appreciated, there is a Quick tutorial. If you'd like to help out the general cause, Become an Ambassador. Your opinion is wanted on these: List of all ideas and designs. 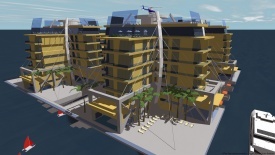 Join the Forum and participate in discussions on Seasteading and related industries or ideas. See Proposals on how to make your own ideas public. Wiki user pages are a place where you can describe yourself and your concepts. There are several different visions of seasteads and strategies for making them happen. The Discussion Forum has a separate user data base. You must register in both places but you may use the same UserID to identify yourself. If we ever gain the ability to merge the two, consistent usernames will be helpful. 260 users have created 1,042 pages and 423 files have been uploaded. Want to help?